Smartwatch sales may be tanking but that’s not stopping Samsung’s production lines. The South Korean electronics maker on Thursday said it would begin accepting pre-orders for its forthcoming Gear S3 line of connected timepieces on November 6 with a launch slated for later this month. Unveiled back in August, the Gear S3 features a 1.3-inch Super AMOLED display coated in Corning’s Gorilla Glass SR+ cover glass with a resolution of 360 x 360 pixels set in a large 46mm watch face. It’s powered by Samsung’s own dual-core Exynos processor paired with 768MB of RAM and 4GB of local storage. Other quick-hit specs include a built-in speaker, GPS, an altimeter, a barometer and an IP68 rating for dust and liquid. Its 380mAh battery is reportedly good for up to four days of use. Some of the industry’s largest Android Wear partners including Huawei, LG and Motorola said in mid-September that they had no plans to release new wearables this fall. It was revealed a couple of weeks later that the next major version of Google’s mobile OS for smartwatches and other wearables, Android Wear 2.0, wouldn’t launch this year as originally anticipated. Market research firm IDC said in October that smartwatch shipments dropped 52 percent in the third quarter compared to the same period in 2015. 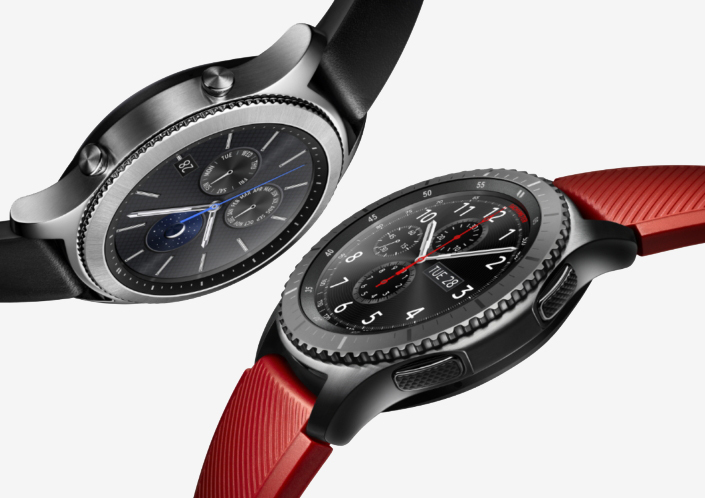 Samsung will offer the Gear S3 in two designs – the sleek Gear S3 classic and the rugged Gear S3 frontier. Pricing starts at $349.99 with both models launching on November 18 at Amazon, Best Buy and Macy’s. You’ll also be able to pick one up at Samsung’s online store or through your preferred wireless provider.